When two parties come together to contract, the best possible practice is to involve a lawyer. Although contracts are made every day amongst individuals (both verbal and written contracts), it is wise to get it in writing where there is much at stake to lose. To non-attorneys, a contract may appear as a simple document, which communicates a promise in exchange for money or some other kind of gain. But in fact, every section of a professionally written contract anticipates the future and resolves issues before they arise. The following are reasons why it is wise to have an attorney review a contract especially for large-scale transaction with a lot of money at stake. When a contract is signed, the transaction between the parties must be as such that it constitutes a contract. There are many factors that determine the enforceability of a contract. This assessment boils down to what a legally enforceable contract requires. Before a court can consider a document as a contract, the parties are required to have had mutual assent. This means that the parties had access to all the same information and were able to agree accordingly. Another requirement is that there must be an expressed valid offer and acceptance. Next, there must be adequate consideration. Consideration is something bargained for and received by a promisor. The parties need to have the capacity to contract and the subject of the contract cannot be an illegal one. An experienced attorney will review these legal concepts to determine the existence of an enforceable contract. A legal professional can thoroughly review a contract and anticipate future disputes. These kinds of disputes are born out of vaguely written contract terms and undefined words. This can also occur when dates are not specified. The many eventualities cannot be anticipated, however, a legal professional is well-versed in using phrases and concepts that captures a wide range of occurrences that may result in future disputes. When an attorney reviews a contract, they will reframe concepts to ensure clarity. A well-written contract includes a clause that provides for a procedure in case of a breach of contract. These terms include whether claims will be settled in court or in a dispute resolution setting. These terms also include instructions on providing notice and by which means. It is the norm that these clauses will include a sentence on governing law as well as venue (the jurisdiction or court where legal claims will proceed). 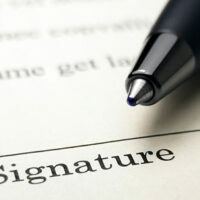 A contract is a helpful tool for two parties who have a mutually beneficial understanding. On the other hand, if a contract is not reviewed by a legal professional for enforceability and other factors, the once helpful instrument can become the source of litigation. The West Palm Beach legal team at the Law Offices of Larry E. Bray, P.A. possesses years of experience reviewing business and personal contracts. We are here to ensure that your interests are fully met.